Snoqualmie Falls is a 268 ft (82 m) waterfall on the Snoqualmie River between Snoqualmie and Fall City, Washington, USA. It is one of Washington's most popular scenic attractions, but is perhaps best known internationally for its appearance in the cult television series Twin Peaks. More than 1.5 million visitors come to the Falls every year, where there is a two acre (8,000 m²) park, an observation deck, and a gift shop. 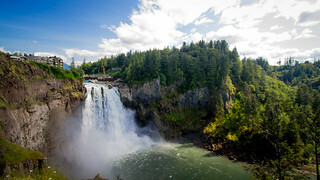 For the Snoqualmie People, who have lived for centuries in the Snoqualmie Valley in western Washington, Snoqualmie Falls is central to their culture, beliefs, and spirituality. A traditional burial site, to the Snoqualmie, the falls are "the place where First Woman and First Man were created by Moon the Transformer" and "where prayers were carried up to the Creator by great mists that rise from the powerful flow." The mists rising from the base of the waterfall are said to serve to connect Heaven and Earth.